Each of our products is carefully designed to meet the greatest expectations. We pinpoint current design problems and innovate to overcome them. We design everything ourselves. Whether you look at the mechanics, electronics or software, we bring our own “fabrication recipes” to our providers. Much to their surprise, these recipes often exceed their own expertise, giving us confirmation that we aim for the best. This control over the whole design process allows us to adapt to any specific needs quickly and efficiently. We create custom solutions for your problems. Our laboratory products are ready-to-use. Order, open the box, plug in the machine and you are ready to roll! The LSPone laboratory syringe pump is a high-precision dosing device for microfluidic applications. The high-accuracy dosing and nearly-pulseless flow stream capabilities make it the perfect tool for multiple liquid handling in the range of milliliter down to nanoliter. 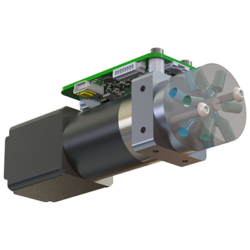 The integrated zero dead volume selection valve allows you to handle multiple fluids with one syringe pump thanks to the high cleaning efficiency and low carryover. Coupled with its ease of use, the LSPone is thus the ideal companion for your laboratory experiments at a reduced investment cost. Our OEM products are completely functional and ready to be integrated in your system. Keep in mind that we can adapt any of these solutions to your specific problem, since we have designed every part of these products ourselves. Showing an unrivaled small wetted volume, a low power consumption and an exceptional ease of use, this valve is the perfect companion for liquid distribution in your instrument or laboratory experiments at a reduced cost. Our dynamic rotary manifolds are coupled to a valve to ensure a limited footprint and increased ease of use. With very precise designs and machining, Teflon materials and no dead volume, we ensure contamination-free experiments and instruments. We can work together to develop your your specific design! Need another solution to your problem? Need help for your microfluidics automation? Our precise and specific expertise is here for you. We design the mechanics, the software and the electronics ourselves, with rigor and precision. We would love to collaborate with you to make your solution come true. Automatic, robust microfluidics systems are what we do. Whether you think rotary valves and syringe pumps are the solutions to what you need, or if you need a solution that just does not exist on the market, or if what exists is not good enough for you, we are here to help you. We have successfully created fluidic systems for technologically-advanced commercial instruments. Various parts of these systems can be changed and ordered separately. Please view the accessories page for more detail.